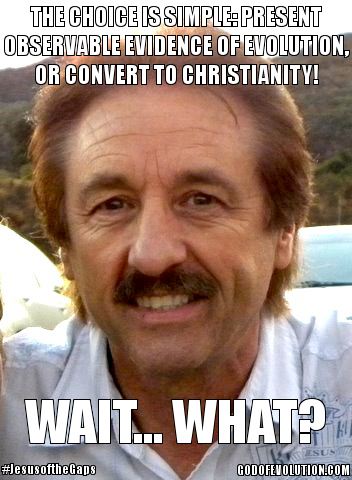 Yes, I watched all of street evangelist Ray Comfort’s latest film, “Evolution vs. God,” and no, I didn’t like it. Which, according to young-earth creationist superstar Ken Ham, means I am a compromising Christian. Or maybe an atheist — I’m not sure. Really, I don’t think K-Ham makes much of a distinction between the two, so it probably doesn’t matter. But alas, no, Comfort’s pet project didn’t cause me to give up my “faith” in the idea of biological evolution, in the same way that seeing a video of ignorant folks on the beach who have no idea what country American colonials broke away from in 1776 does not make me question the existence of the United States or the value of the academic discipline of history. Honestly, after suffering through the whole thing, I’m a little baffled as to how the young-earthers can actually believe the movie presents any kind of legitimate challenge to the rigorously well-established theory of evolution, as they have been breathlessly asserting for months. Consisting entirely of heavily edited “people on the street” interviews with a few science professors and a lot of undergrads, RayCo’s film does nothing more than trot out the same tired, fallacious arguments YECs have been riding for decades. Of course, if it were just a bad movie, that wouldn’t be all that big deal of a deal. It would just mean 30 more minutes of crap had been uploaded onto YouTube, which is a crime roughly equivalent to littering in a landfill. What’s concerning is that RayCo spends the entire second cringe-worthy act of his film walking his interviewees through the steps of his standard Way of the Master evangelism routine, wherein he attempts to rhetorically back people into a corner such that they are either forced to become Christians or admit that they want to spend the rest of eternity in hell. The problem is that the gospel (that we are all sinners, offered new life by the grace of God) doesn’t belong in the same movie with Comfort’s supposed critique of evolution — even if it were legitimate. The good news of Jesus Christ does not proceed from the logical consequences of any scientific discussion. It just doesn’t. I know not every believer shares my views on evolution. But I do think most Christians would agree that a presentation of the gospel should not bookend a film whose main goal appears to be making anyone who disagrees with the filmmaker look stupid. …how wrong it is to use God as a stop-gap for the incompleteness of our knowledge. If in fact the frontiers of knowledge are being pushed further and further back (and that is bound to be the case), then God is being pushed back with them, and is therefore continually in retreat. We are to find God in what we know, not in what we don’t know. But Comfort’s message is worse than the God of the gaps. It’s the Jesus of the gaps. And this is far more sinister, because the same fate that awaits the God of the gaps — that he becomes smaller and smaller every time a “gap” in our knowledge gets filled in — will also befall the Jesus of the gaps. I wonder if RayCo ever thought about what will happen to his Jesus of the gaps when Darwin’s theory is vindicated beyond any possible doubt. Humanity can survive without the deistic God that lives in the gaps, after all, but we have no hope without Jesus. Eh, I’m sure ol’ Ray is way too busy to waste his time speculating on such things. 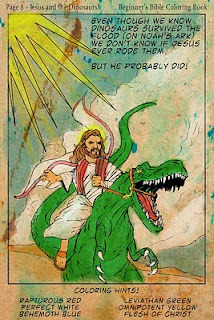 He has “Evolution vs. God: Requiem” to prepare for, after all. After reading this, I imagine you’re just dying to see the full film, so here you are. Go nuts, and let me know if you think I’ve been unfair in my assessment. Also, feel free to click over to my site, God of Evolution, and see my full review there. Pingback: Where Have They Gone? I watched the film a while back, and share your discomfort with Comfort’s approach. That said, it’s the same sort of style almost all documentaries are done these days, especially since Michael Moore. That is, line up your opposition in a defenseless position and then mow them down. Neither to I share Ray’s heaven-or-hell view of the future for I believe that the Bible teaches that everyone is going to heaven. Even so, Ray seems to stand up for belief in Christ and belief in the Bible. For this reason, I view him more favorably than, say, Richard Dawkins who seeks to stigmatize faith in Christ. Hey, thanks! Sorry for your trouble! Dear Mr. Francke: What is your opinion on Lee Strobel’s book, “Case for a Creator”? Hi again, John! Thanks for the question! I read Strobel’s “The Case for Christ” in college and very much enjoyed it. I was much less impressed with “The Case for a Creator.” Personally, I think the existence or non-existence of God is simply not a question science can answer. Science investigates nature, but God is supernatural. Science investigates the material, but God is immaterial. Science investigates all of that which our rational brains can understand, but God’s ways and thoughts are higher than ours as the heavens are higher than the earth. So, in my opinion, for the Christian or the atheist to claim to be able to make a “scientific” case for their spiritual belief or non-belief is fallacious on its face, and a misuse of science. What do you think? OK. You say science cannot prove or disprove the existence of God. What about truth? Can all truth be proved scientifically. And what is the purpose of faith in reference to truth? What do you say about Bertrand Russell’s “Why I am not a Christian” and C. S. Lewis’ “The Case for Christianity”?